IL&FS Crisis: NBFCs and Real Estate on Tenterhooks! It may be true that ‘when the going gets tough, the tough gets going,’ but this does not hold true for the Indian real estate sector currently. The ongoing crisis in ono-banking finance companies (NBFCs) post Infrastructure Leasing and Financial Services (IL&FS) default has made things even more difficult for developers. Post the banking system’s freeze on real estate funding due to rising non-performing assets, NBFCs and housing finance companies (HFCs) were the sole source of funds for the cash-strapped developers. Now, however, NBFCs themselves are struggling and their loan disbursals to developers have slowed down significantly. A source of broad spectrum dismay and despair, the NBFC crisis needs to be resolved as soon as possible or the real estate sector's much-anticipated recovery will be postponed by a couple of quarters more. As a Credit Suisse report reiterates, NBFCs and HFCs have played a major role in credit supply in recent years, accounting for nearly 25-35% of incremental overall credit. While bank credit growth in the last two years averaged at a mere 7%, strong 20%-plus growth in NBFC credit aided overall credit expansion beyond 10%. What began as a singular event with one of the biggies - IL&FS - failing to repay its commercial dues has blown up into a liquidity crisis for the entire NBFC spectrum. As an immediate aftermath, NBFCs' stocks went into free fall. The top 15 NBFC companies cumulatively lost over Rs75,000 crore in just two initial trading sessions. To say that this rattled investors would be a gross understatement, and the Government and regulators’ immediate efforts to rein in the panic failed to curb the sell-off tidal wave. Since 20 September, NBFC stocks have tumbled by more than 50% for DHFL. The current NBFC crisis can have a cascading effect on the real estate sector’s growth forecasts, which were already nebulous on the back of the liquidity crisis created by rising defaults and non-performing assets in banks. The liquidity crisis plaguing NBFCs is likely to hit stake sale and fund-raising plans for these lenders in the near term. With real estate having a strong correlation to credit availability, it could be worse for already cash-starved developers. As per ANAROCK data, more than 5.75 lakh residential units are running behind schedule across the top 7 cities since their launch in 2013 or before. The major factor contributing to this delay is the liquidity crunch developers are experiencing to the backdrop of tepid sales. Despite residential sales gradually picking up q-o-q, they are nowhere near their peak levels. With substantial number of residential projects running behind schedule, the crisis could further exacerbate liquidity woes and impact project delivery timelines even more. Some NBFCs like Indiabulls also provide home loans to individual homebuyers. With banks tightening their norms for lending to individual homebuyers in recent times, NBFCs were seen as the best alternative. Therefore, the ongoing NBFC liquidity crunch will also impact home loan approvals and disbursements, inevitably reducing residential property demand in the short-to-mid-term. Apart from weak residential sales, increasing input costs and promotion expenses coupled with the high compliance costs will result in decreased earnings before interest, tax, depreciation and amortization margins. With most things being unequal in Indian real estate, the impact of this crisis will not be the same across the board. Many listed realty developers such as Puravankara, DLF, Prestige Group, Oberoi Realty and Godrej Properties have well-diversified portfolios, including commercial and retail. Many of these players have also reduced their debts and ventured into affordable or mid-income housing, where growth is currently the highest. In the highly competitive real estate business environment, these players will, in fact, may emerge stronger as they are better equipped to ride the storm and continue to deliver while others cannot. Large-scale consolidations are already ensuring that only the fittest will survive in the future, and this crisis will hasten the process. higher cost of funds raised HFCs will sharply increase EMIs for borrowers . Although payments remains one of the brightest spots on the financial services landscape-propelled by positive macroeconomic tailwinds, continuing technological advances, and expanding digital (and other noncash) mechanisms and habits, banks and other payments providers must solve lingering customer pain points if they hope to capitalize on the opportunities at hand and achieve a positive trajectory for the future, says a study report. The report, 'Global Payments 2018: Reimagining the Customer Experience', from Boston Consulting Group (BCG), says as disrupters enter the market and vie for position, incumbents must deepen their customer understanding, foster trust and loyalty, and improve cross-selling to maintain momentum. ""In both the retail and wholesale payments business, customers are becoming impatient with clumsy interactions and inefficiencies," says Mohammed Badi, a BCG senior partner, and leader of the firm's global payments and transaction banking segment, and a co-author of the report. "Consumers, treasurers, and merchants are looking for automated, integrated buying journeys and tailored service. They are being conditioned by their buying experiences in other industries. Banks, in order to stay relevant, must respond faster and more strategically to the altered payments environment by focusing on the pain points that matter most across the overall customer journey," he added. The 16th annual study by BCG outlines recent developments in the payments market globally and regionally, explores how retail providers must evolve the payments journey, and explains how wholesale banks must address the expectations gap between themselves and their customers. Talking about India, the report from BCG says, the country has seen payments volumes rise significantly in the two years since demonetisation. In 2017, total payments revenue equalled $20 billion, compared with $17 billion in 2016. "We expect that payments revenue will increase at an 11% compounded annual growth rate (CAGR) over the next 10 years. One factor behind this growth has been the availability of innovative payment methods such as Paytm and Google Pay (formerly Google Tez), which have expanded payments access. Another factor has been the Indian government’s push to advance noncash payments, an effort that included promoting payments infrastructure modernisation and waiving the merchant service charges (MSCs) for debit transactions below $30 through a subsidisation program," it added. The report says that retail banks, merchant acquirers, and payments providers have the opportunity to increase revenue significantly over the coming years. 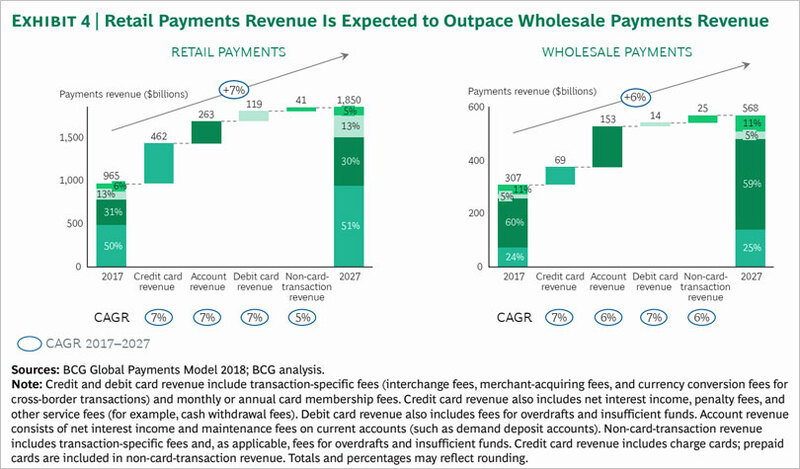 BCG data shows that retail revenue is on track to outpace payments revenue from wholesale banks. "Maintaining strong growth, however, requires that retail payments providers address crucial customer pain points," it says adding "In a 'click of a button' world, buying journeys that are riddled with manual processes and clicks feel especially jarring." As digital giants and fintechs vie for their share of the payments space, card issuers must address key irritants across the purchasing journey to retain existing customers and expand their base. The report describes five ways in which payments providers can improve the online buying experience: simplify and harmonize authentication, inject new value into the buying journey, reinforce leadership in card-on-file payments, embrace the move to online financing, and develop payments solutions that work globally. The report further explains three ways in which acquirers can improve the broader merchant experience, including deliver integrated payments, adopt a new go-to-market approach, and invest in adjacent services. According to analysis in the report-complemented by data from SWIFT, the world's leading provider of secure financial messaging services-payments revenue has been growing at a CAGR of 6.8% globally since 2010, reaching $1.27 trillion in 2017. Projections for the next 10 years look equally positive. BCG says it predicts that payments will become a $2.42 trillion market by 2027, with more than $1 trillion in new revenue generated over that period. "Such growth would translate into a CAGR of 6.6%, outpacing global nominal GDP growth. The ongoing shift to noncash payments is driving that expansion and creating a windfall for payments providers, despite mounting pricing pressure in interchange rates," it added. Talking about wholesale payments, the report from BCG says, there is a need for addressing expectations gap by corporate treasurers. It says, "On one hand, they must manage core cash flow and liquidity operations with greater speed and efficiency. On the other, they must address a growing number of strategic business issues at the enterprise level." "Wholesale banks have not kept up with these evolving demands. Not only have they been slow to innovate their product and service offerings, but they have been slow to address basic shortcomings in the customer experience. Those gaps have opened the door to nonbanks," it added. According to BCG, while enterprise resource planning (ERP) providers, treasury management systems (TMSs), and fintechs lack the institutional expertise and full-service capabilities of wholesale banks, they are taking share in a number of areas. Wholesale banks must close the expectations gap or find themselves sidelined. "Wholesale banks can close the gap in three basic ways such as embrace a clear digital strategy, get strategic with service delivery, and enrich the customer experience with data-driven insights," the report concluded. Payment players in India especially the private ones have multiple ponzi points like minimum balance for customers (try recovering your PayTM balance from Uber for example), multiple days before merchant gets credit, no set timelines for customer or merchant redressal and worst of all, squeezing smaller merchants. The government has diverted Rs1,000 crore from the small savings schemes, which are used by common citizens as means of household savings and safe investment, to the ailing national carrier Air India. These schemes include postal deposits (savings account, recurring deposits, time deposits of varying maturities and monthly income schemes), savings certificates (national small savings certificate VIII-NSC and kisan vikas patra- KVP) and social security schemes like public provident fund (PPF) and senior citizens‘ savings scheme (SCSS). According to reports, Air India has raised Rs1,000 crore from National Small Savings Fund (NSSF) to meet its working capital requirements. Quoting an official from the carrier, a report from Economic Times, says, "We have received Rs1,000 crore by way of loan from the National Small Savings Fund last week. This loan has been availed at a lower interest rate. However, we have to repay the loan amount by March next year." Air India, which is sitting on a debt pile of over Rs50,000 crore, has been struggling to raise money since last year. At the end of March 2017, the total debt of the carrier was estimated at Rs48,877 crore, including Rs17,360 crore as aircraft loans and Rs31,517 crore as working capital loans. Replying to a question in Parliament in January 2018, the government had projected Air India's net loss for 2017-18 at Rs3,579 crore. The airline had also defaulted on salaries besides delay in payments to oil companies, engine makers and aircraft lessors. In June also, Air India borrowed short-term loans worth Rs1,000 crore to pay staff salaries and meet other obligations, following a failed privatisation attempt. The national carrier had raised Rs6,250 crore from various banks between September and March last fiscal. Last year, the Union Cabinet allowed Food Corporation of India (FCI) and other State-run entities like National Highway Authority of India and Air India to borrow funds from NSSF. The government borrowing funds from NSSF, however, comes at a higher cost and could add to the stickiness of interest rates as small savings rate are kept high to ensure adequate inflow in to these schemes, points our Ira Dugal, in her column published by BloombergQuint. Following recommendations from the 14th finance commission, the government got more room to borrow from the NSSF. This year, for instance, the government is likely to finance more than Rs75,000 crore of its fiscal deficit from the NSSF. Past year, the government financed more than Rs1 lakh crore of its budget or about 17% of its total deficit through NSSF. On one hand, the government is helping save institutions like IDBI Bank and Infrastructure Leasing and Financial Services (IL&FS) by ripping funds of Life Insurance Corporation of India (LIC). On the other, the government does not even seems to be sparing most reliable and thus popular savings schemes of common citizens. The NSSF, established in April 1999 in the public accounts of India, is administered by department of economic affairs under the ministry of finance. All deposits under small savings schemes are credited to NSSF and all withdrawals by the depositors are made out of accumulations in the Fund. NSSF invests the net collections of small savings in the special state government securities (SSGS) as per the sharing formula decided by the government of India. The remaining amount is invested in special Central government securities (SCGS) with the same terms as that for the states. These securities are issued for a period of 25 years, including a moratorium of five years on the principal amount. The special securities carry the rate of interest fixed by the government from time to time. Any Institution lending money to Air India will drown along with Air India. The way our finance minister is handling our money in different organizations such as LIC of India, Small savings schemes and so on; the day is not far when India will need its own form of quantitative easing.